Greater visibility to stakeholders: it can be an ongoing battle. Even when they’re au fait with the vagaries of ‘when we finish this we’ll start on the next priority feature’, keeping them up to date can be tricky. And what about the “zoom level”? Stakeholders want to see the big picture (roadmap) and the detailed planning. We see teams tackle it many different ways, and often end up with a separate backlog of epics, or a feature roadmap, or future sprints mapped out across the wall. Craig of Better Projects sent us this hack by colleague Ben Birch at Aconex. 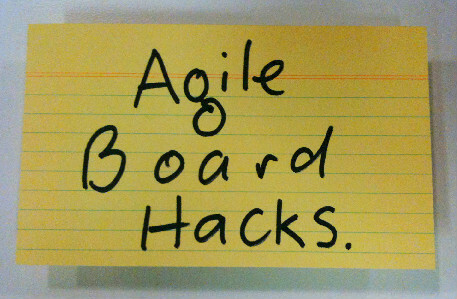 It gives tight focus to the team’s work, without the need for a separate wall for a roadmap. 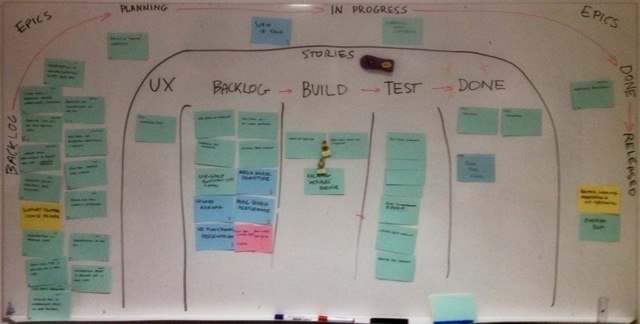 They simply added a lane around the outside of the sprint board, which indicates the flow of epics through their development lifecycle – from the backlog, through planning, development and release. Epics travel across the top of the board – the further they go, the nearer they are to completion. Epics start their journey in the backlog. The priorities are fairly fluid here, as priorities change and new features are added. Realistically, anything not in the top two or three epics is aspirational. And with multiple stakeholders, this is where the horse-trading of priorities can take place. These epics haven’t yet had much work done on them — and commonly haven’t been broken down into stories. An epic in the planning stage is in the process of being broken into stories and analysed through more carefully. The product owner is working on them, perhaps there UX investigation going on, or there may be some spikes in play. An epic moves into in progress when work starts on the first story card. Story cards for the epic are added to the stories backlog on the main, internal area of the board — and colour coded to match the epics in progress. In the picture we can see one green epic nearing completion, with another blue epic just beginning. It’s worth noting that all the stories for an epic are added here, there is no separate backlog for stories. When necessary, the team will draw a line through the story backlog to indicate where they plan to get to within the current sprint (not shown in this picture). When all stories for an epic are complete, it moves into done, ready to go live with the next release. It’s a simple hack, and it’s helped the team clearly communicate where various features are up to to their many stakeholders. Thanks for sharing Ben and Craig!